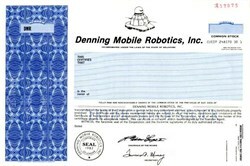 Beautifully engraved Specimen certificate from Denning Mobile Robotics, Inc. This historic document was printed by the Security Columbian Banknote Company and has an ornate border around it with a vignette of the company's robot product. This item has the printed signatures of the company's officers (Robert W. George II as Chairman) and is over 16 years old. The company developed the world's most advanced sensor arrays and artificial intelligence software, which were classified "Secret" by the Department of Defense. The software and robots were then manufactured by Raytheon Corporation. The company developed six revolutionary products including robotic TV cameras, security robots, and delivery, research and floor-cleaning robots. These certificates are normally stamped "Specimen" or they have small holes spelling the word specimen. Most of the time they don't have a serial number, or they have a serial number of 00000. This is an exciting sector of the hobby that has grown in popularity over the past several years. Denning-Branch is a merger of Denning Mobile Robotics, once located in the Boston area, and makers of human-size mobile robots since 1983, and Branch and Associates, of Hobart, Australia, designers and builders of smaller mobile robots since 1979.